In one of our food trips, we went out of our comfort zone and headed out of the suburbs and into the city center of Pasig to dine in Café 1771. Although the restaurant has been around for three years already, it is more popularly known as a breakfast destination. I discovered though that it also gives its diners an option to go for healthy eats. My husband and I decided to pamper our palates with a nutritious lunch when we visited Café 1771, a more casual and upbeat version of Chateau 1771, which both belong to the 1771 Group of Restaurants. Upon entering the establishment, I felt a light and cheerful vibe as the spacious dining room was decorated by modern pieces of furniture. The chairs were not necessarily matching but they all looked well together because they were upholstered in uniform hues of fuchsia and turquoise. They called it the Whimsy area and it was peppered with conversation pieces like the floor mosaic near the entrance door, decorative plates on display, and paintings at the counter. There is an open doorway on the side that leads to the Lounge, which comprises of two library-themed function rooms. Its walls had shelves that were stacked with books, picture frames, and other knick-knacks. The area had a formal feel and seemed ideal for business functions or private parties. The Whimsy area, on the other hand, has a younger and happier vibe so we decided to get a table there. 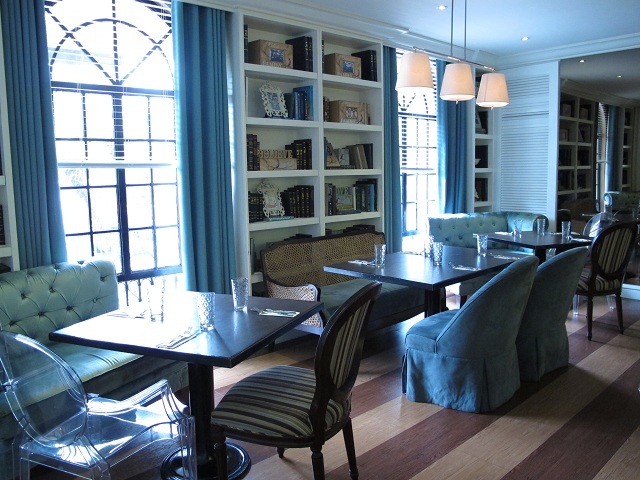 I discovered that the establishment’s interior designer was Ivy Almario, but 1771 Group CEO and restaurateur, Ricky Gutierrez, was very hands-on with it as well. The design was inspired by both the owner and chef’s European travels. The two love to travel abroad because that is where they get inspiration for new restaurant concepts and how they keep up to date with international trends and standards. Since we decided to become more health-conscious, my hubby and I thought we would start with some soup and salad. We ordered the soup of the day, which happened to be tomato soup. The orange-colored creamy goodness was topped with croutons and cherry tomato. It didn’t look or taste like something out of a can! It had a smooth and thick texture and it tasted mostly tangy with a hint of sweetness. I found it very rich and filling. We also got a plate of mixed greens called Walnut Chicken Salad, which was drizzled with green apple vinaigrette. It had a good balance of flavors and textures—the lettuce was crisp, the candied walnuts were sweet and crunchy, the arugula leaves were bitter, the grapes were tart, the chicken slices were bland and tender, and the dressing made everything come together. The serving size was big and more than enough for the two of us. When our main courses arrived, I almost salivated over the mouthwatering presentation of the food. We shared the Vegetable Lasagna, which had a medley of veggies between the layers of baked noodles. I bit into some eggplant, zucchini, and bell pepper, which were smothered with garlic-Parmesan-flavored béchamel and Napolitano sauce. I enjoyed every cheesy bite of it. My husband, a meat lover, didn’t even miss the meat because it was really delicious and satisfying. We also shared the Organic Chicken in Potato Crust that used free-range poultry. 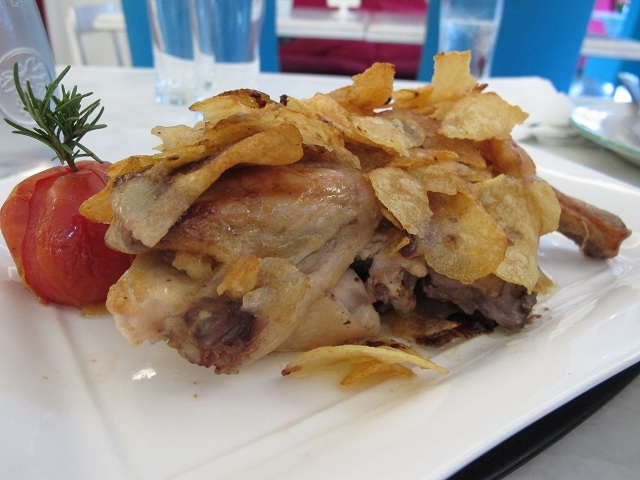 The slow-baked half-chicken was encrusted with cracked potato chips that added crunch to it. It was a good contrast to the tender meat. 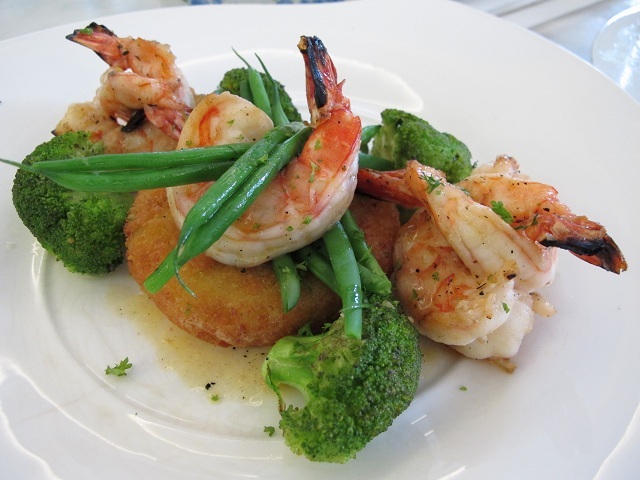 But the dish that won us over—and the prettiest one at that—was the Lime Butter Prawns. Five headless and good-sized shrimps were grilled and served on a bed of risotto cake and broccoli. The prawns were cooked just right and we liked the fact that it was a filling dish, but not as heavy as its meat counterparts. Throughout the meal, we sipped on fresh pomelo juice to help bring all the scrumptious food down. The iced beverage had a slightly pink hue and the glass was brimming with pulp bits. It was sweet and refreshing and I think I could drink a whole pitcher of it, if they had one. All the ingredients were sourced from reliable local suppliers. While there, I also learned the reason for the restaurant’s healthier menu. Chef Vicky had to radically change her diet due to health reasons. She also had to attend a detox session, after which she became aware of the effects that a chef or a restaurant can have on its clients’ health. That spurred the connection between the menu creation and nutrition. We didn’t finish all the food, as we felt quite full already. To cap off our meal, we drank some hot tea and coffee. I know we were supposed to eat healthy but I just couldn’t resist the call of dessert. A row of delectable cakes and pastries were featured on the display counter at the center of the restaurant. I almost ordered the Sugarless Carrot Cake but the server mentioned that the Rose Noire was one of their bestsellers. I thought I would treat myself to something sweet since I ate such a healthy lunch already. One bite showed why it was one of the popular desserts. 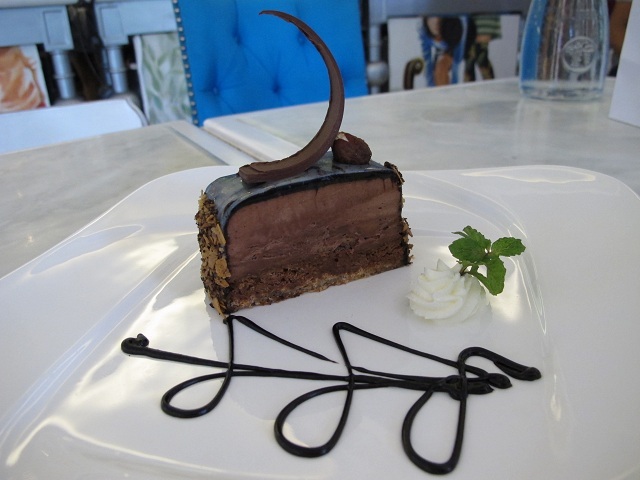 The cake was layered with dark chocolate ganache, meringue, and hazelnut praline topped with gleaming chocolate glaze. It tasted very similar to the Ferrero chocolate and it even had a crunchy crust, similar to the famous chocolate brand. It was the ideal dessert for a chocoholic like me. I finished the whole serving without batting an eyelash. I left Café 1771 with a big smile on my face—partly because of the excellent food and also because I saw that my hubby had to open the button of his trousers after eating such a filling meal.